Frequently asked questions, gathered from our 2017 CSS Profile webinar.…. Since wife and I file jointly, can we enter together as “Parent 1”? Should I do the schools in order of preference or some other order? Is there a max number of schools like on FAFSA? Can we add schools at a later date and time? What’s the cost to send the CSS Profile? How are health savings accounts treated? If your answer is zero should I enter zero or can I skip (with no star)? You can skip it and leave it blank. When filling out the form, can we pause, save it, and return at a later date? Where does any 1099 income get listed? could this just go under income? Each box indicates which line on the IRS to get the information from. Just follow the directions. What if you purchased house for 500K and put 200K in renovations in? Should you report your cost basis or just purchase price? I know we have to send in our tax forms. Do we also have to send in a mortgage statement? How do they check up on our house values? You do NOT send in tax returns or tax transcripts unless the school tells you to. Use the current market value of your house as estimated on a real estate site like Zillow. So you have to report a different child’s UTMA’s for this student?? YES, under the question where it asks for siblings assets. Even if you file jointly, I’m guessing you fill out all info for Parent 1 and then Parent 2? Is there any way to report that the family has both a mortgage and pays rent if parents are married but live apart due to work requirements? What if my husband has his own business, i have a job where I work for someone and I have my own side business (1099)? How do we input this? It says parent- do we go thru this twice one for each parent or is this something you combine? Do you file a joint tax return? If so, just follow the directions on where to input the information from the tax return. Real Estate owned by LLC, parent is sole partner in the LLC–so ALL RE value is required to be reported from this corporation? YES, business assets are not sheltered on CSS like the FAFSA. So if the student babysits and gets paid cash, you just estimate what they earned? I’d also like to know about disclosing babysitting cash payments. As well as if cash received for birthdays and holidays is supposed to be included as Gifts. If the money is sitting in the students savings account it gets added as assets. If the gift money is substantial to be used for college you need to disclose it. $20 for a birthday or Xmas, no. I would like to clarify–are balances form small business accounts to be included in the CSS. Are bank account balances reported for a small business? If a parent is reasonably affluent but maybe has unique situation (ie a handicapped child) how should they handle this. Maybe they could afford to pay say $30,000 but have these other obligations. What about changes in health insurance status… ie having to go on Cobra for upcoming year? Is this exceptional if the cost is significant. It depends on how substantial it was. If you didn’t have to pay for insurance and now have to pay $2000 a month then yes, explain in special circumstances. If your ins. Went up $250 per month, no. So exceptional health insurance premiums as self employed individuals would also be considered exceptional? With the question that asks, “what does you parent expect to contribute” it is probably safe to put down as figure NO larger that the federal methodology EFC. Do you agree? If that’s what you can afford to pay, then answer with that number. How long does it take for colleges to get the profile once submitted? I think they are sent fairly quickly. It depends on how frequently the recipient (university) downloads the info. Best bet would be to check your app status, if it is a school that you are able to do that with; if not, contact the fin aid office by phone. How do they check up on retirement accounts? If they feel you haven’t disclosed your assets you can always be asked to submit your statements. Schools want all this info… but you said they don’t want to know about a HELOC or second mortgage? It cancel’s out some of your net worth. I think you are confusing the statement they don’t CARE what your bills are. How do we estimate what the anticipated earnings of our child while at school when we don’t yet know where she’s going to school and where she would be working? Just a safe guesstimate. Most Profile schools expect the student to provide $2500 per year towards their cost of paying for college. I have 2 students, next year the older one will be Junior in college and the younger a freshman in college. Do I create separate CSS profiles and repeat all the information or is it one profile account for the family with a way to enter information for each student. Yes, separate. The CSS Profile is individual to the student and their school. Some require CSS every year, some only Freshman. Is untaxed income considered pre-tax contributions to 401K? Eldercare expenses, if you have them how do they expect documentation? If asked for documentation I would imagine you would have receipts to show. Can this be submitted for one school – then adjusted for additional schools at later date (like FAFSA – adding schools)? For your questions list: if there are supplemental questions (like the ones about # of cars), are those visible to the other schools as well? We have unusual situation. We are Elderly parents, own our home outright and living off Social Security and SEP Retirement Accounts. In your experience will universities require us to draw down prematurely fromSEP accounts and/or get a mortgage on our home to make expected parental contribution for our 18 year old son to attend college? Thanks. No, they can’t require you to do anything. But they will look at your income from SS and retirement and your assets. If you are over the age of 62 you can qualify to get a reverse mortgage to help you pay for college without drawing from your retirement, possibly no need to take a student or parent loan, and never have to make a payment! Talk to a professional! As a non-custodial divorced parent, does student need to file the CSS before I get an email to enter my info? Do I need to enter Parent 2 if we are divorced? The non-custodial parent will be completing their own Profile. The email needs to be sent to them. For divorced parents who have to answer this, how should they answer what they intend to give, assuming there is no court ordered/agreed upon amount?? Divorced parent should answer the question with whatever is the contribution they plan to make, whether or not it is in an agreement. I am the non-custodial parent and she has a checking account through my credit union. Does her credit union account balance get entered here? Or when I fill out my part of the profile? If the account is in both of your names, yes. Do I have to ask for a waiver from every school my son will apply? The waiver we spoke of on the webinar is only if the school requires the Non-Custodial parent to complete a CSS and they flatly refuse to cooperate. I am separated from my husband. I have my son from a previous marriage. we not in touch with his father. Do I have to put my husband on the CSS? I don’t have any information about him because he moved a few months ago. If you are separated from your current husband you do not need to include his information. You’ll have to fill out to ask for a waiver for the non-custodial parent. It’s up to the college to decide. Do I have to fill out a waiver for each one individually or just one that goes to every college? No. Complete only one Noncustodial PROFILE Application. 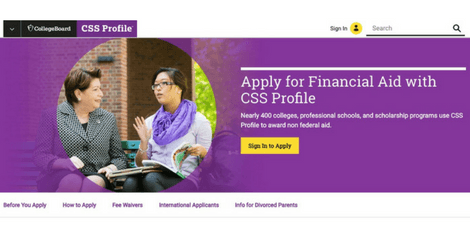 The College Board will send your information to each of the colleges and programs your daughter selected on the PROFILE that require the Noncustodial PROFILE. DOES THE NON-custodial parent also have to list the schools for the PROFILE to be sent to? No. They will fill out one NC application that will be sent to all of the required schools. Older PostHow Do Parent Plus and Private Student Loans Compare?